I’m alive. And in Florida. I swear that I do not even have time to poop at this place. I’m down here in Daytona Beach, Florida leading a high school mission trip and this is the first second I’ve had online since Friday night. It’s amazing and awesome and God is here changing hearts and lives. And don’t worry, I’m sure I’ll write tons about that as soon as I get back to the real world. How I wear my hair almost every day here. 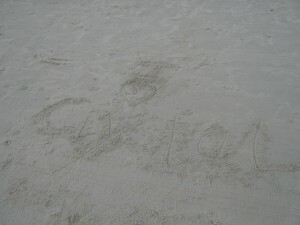 I wrote my name in the sand, and then a youth kid wrote “I heart” How cool is that? 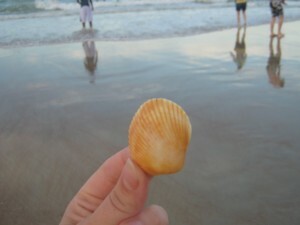 A seashell by the seashore. In case you haven’t heard, Randy and family are coming 7/2 so I’m pretty sure a party will be here on 7/3 for the parade. God Bless you and keep you safe on your trip home. 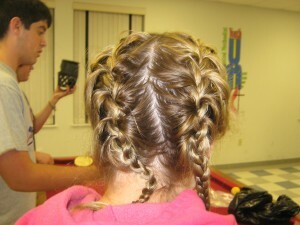 i LOVE your hair like that! the seashell by the seashore caption made me laugh out loud. what do they call that? a lol? i lolled.